Removes the thatch from the base of the healthy grass, aerating the soil to allow in air, light and water along with all the required nutrients to encourage healthy growth. This helps to maximize grass yield. If the ground is particularly uneven due for example to mole hills, then chain harrowing may be more effective. Like tine harrowing, removes the thatch from the base of the healthy grass, aerating the soil to allow in air, light and water along with all the required nutrients to encourage healthy growth. However our frame mounted chain harrows also level and breakdown minor undulations in the ground caused by mole hills and the like. This allows bare and patchy ground to be reseeded with the appropriate grass seed without the need for ploughing or disc harrowing. This reduces the chance of weeds taking hold, whilst still allowing stock to graze. Over seeding can be carried out individually or combined with harrowing. Rolling levels out uneven and poached ground caused by over wintering stock. This is an important process as rutted ground can lead to foot health problems for animals, particularly horses. Regular topping prevents grass and weeds (ragwort, docks, thistles & nettles) from going to seed. It keeps the grass at optimum grazing length and encourages a strong and thick grass sward and prevents weeds from flowering and establishing seed. Application of fertiliser will encourage strong grass growth and increase yield.This will encourage strong grass growth and improve yield. Once a weed problem has been identified an appropriate weed killer can be applied, either by spot application or by boom application with our pressure regulated ATV mounted equipment. Our staff are trained and accredited to the PA1, PA2 and PA6AW standards, meaning that as well as applying herbicides by knapsack or ATV boom sprayers, we can also apply herbicides on and near water. We can also apply for the necessary permits from the Environment Agency and NAtural Resources Wales for you. 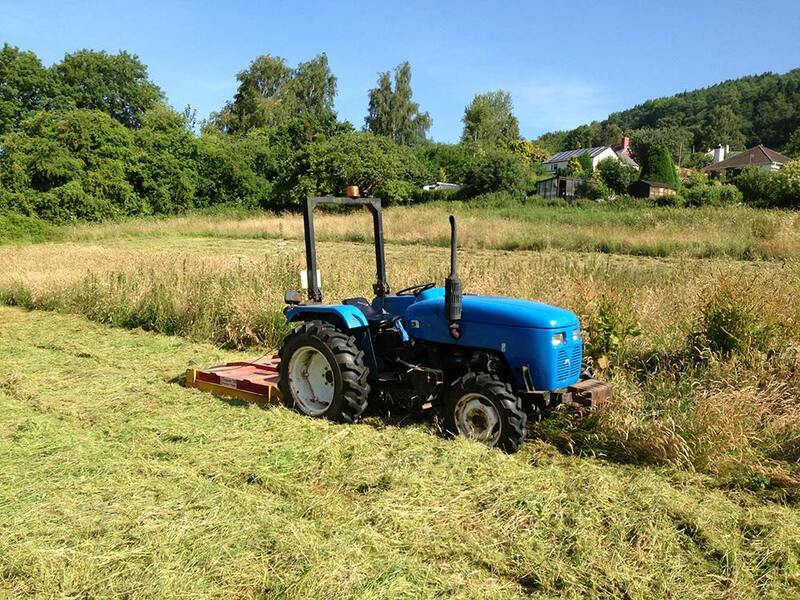 We can provide a complete hay and haylage making service which includes mowing, drying, baling and stacking.